I’m an open and positive girl with lots of experiences. 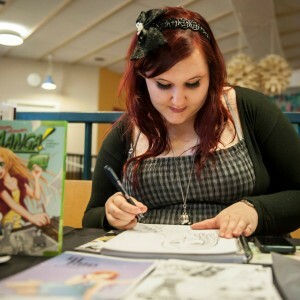 I have lived in Japan for two years, attended two years of Malmö Comic school, and more. I work as a manga teacher at Kulturskolan in Malmö, and am also attending a course in bookmanship in Lund. I am also accepting freelance jobs as comic artist, manga artist and illustrator. If you want to know something specific about me that isn’t written here, write a comment and I’ll answer! I accept freelance jobs like drawing comics, manga and illustrations. I am also accepting work as a comics, manga or Japanese teacher. Contact me at elise.rosberg(at)gmail.com for prices and schedule booking. Collecting: Royal Albert Moonlight Rose-porcelain. See my blog about it here! See more at illustrations or my mangas. Click the pictures for bigger format. Digital. 2014. Meroko and Takuto fanart. Elsa and Jack Frost. 2014. Copics. Princess Starla fanart. 2012. Digital. Digital. 2012. Cover for the book Klara, färdiga, manga! Ett samarbetsprojekt mellan mig och några vänner. Framsida till Freya anthology. Färger av mig, linjer av Diana Davidsson, skiss av Anette Bengtsson.